"Meet McKenna, our 2012 Girl of the Year! She's a determined girl who uses her strengths to turn challenges into triumphs. The McKenna doll is 18" tall, with brilliant blue eyes that open and close. She has long, caramel-colored hair that can be pulled high for gymnastics practice, or styled up in twists for a fancy occasion." I would like to win McKenna for my daughter,because she is always looking at American Girl Doll catalogs and has always wanted one. my daughter is saving up for McKenna, she is 8 and has Kit, my husband and I were planning on buying it by Nov if she doesn't raise the money by then. She love to win it though, and then be able to buy accessories for her! I have 3 girls who would love to play with McKenna! I would win her for them :D They dont have an American Girl doll yet and have been asking for one for a long time now !!! I would love to win this for my youngest daughter Evie because she is crazy about babies right now. I would love to win this for my daughter Madelyn as she is OBSESSED with all thing AG! We call the catalog the bible around here ... she would be beside herself if mommy won McKenna for her! 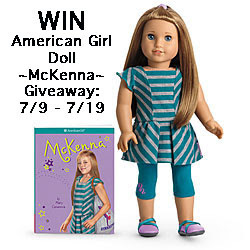 I would love to win Mckenna because she would be my very first AG Doll I love her she is so adorable. I would love to win McKenna because my girls are doll OBSESSED!! This would be a very first AG doll! So exciting! I would love to win one for my niece!! It would make her Christmas!!! My five-year-old desperately wants McKenna because she loves her name! I would like to win for my granddaughter..thank you. My 3 year old would love to win Mckenna. She has been asking for it since it came out. She thinks its funny that its her middle name. Because my daughter has been begging for an American Girl doll but they're out of our budget. My girls would love this! Watched the movie on tv last night. I have an 8 year old daughter and she has always wanted a real AG doll but we can't afford one so I'd love to win it for her and then she would like to pass it on to her younger cousin once she is too old for it which I figure will be a couple of years at least. 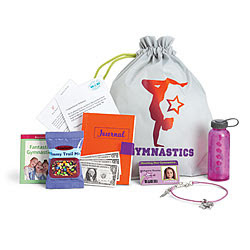 I would love to win this for my 8yr old daughter. She keeps asking for an AG doll but with both my husband and I not working right now. We couldn't afford it when he was working and definately can't afford one now. Thanks for hosting such a great giveaway. Winning McKenna would mean the world to me. I would give her to my cousin's little girl Brookelynn, who has bright blue eyes and sandy blonde hair, because I know McKenna would bring Brookelynn as much joy as American Girl Samantha brought me when I was a little girl. would love to win for my daughter, she loves AG dolls! My daughter always looks at the catalog and I wish I could win this for her. My daughter loves, loves, loves American Girl dolls. She looks over the catalogs until they fall apart. She has a hand me down one from one of my friends but would love a new one with the code to play online games. I have four daughters and any one of them would love this doll! My daughter would LOVE this doll. We just watched the movie! Going up for parent's weekend at camp this weekend. Her requests of things for me to bring? Nope, not candy or cookies. "Mom, could you please bring the latest American Girl catalog and my magazine?" Yup, she's hooked and cannot wait to see the newest movie. What a great giveaway! I would love to win McKenna for my 7 year old daughter. We're in the process of building a doll bunk bed for her and this would be the best surprise for her to find inside! I'd love to give McKenna to my almost 8 year old on her birthday in a couple of weeks!